Total Living Area: 2249 Sq. Ft.
First Floor: 1699 Sq. Ft.
Second Floor: 550 Sq. Ft.
Width: 61 Ft. Depth: 54 Ft.
Main Level: 1699 Sq. Ft.
Upper Level: 550 Sq. Ft.
Sun, Moon and Stars This charming home features a wraparound porch at the front and a number of unique features. A corner sunroom topped by skylights suggests relaxed contemplation of the heavens above. 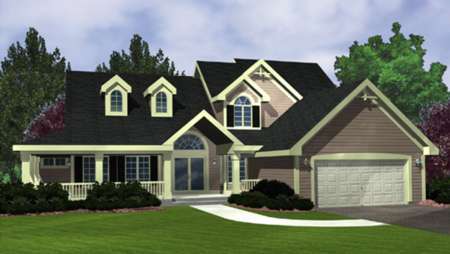 A private porch serves the master suite, which also enjoys a walk-in closet and sunny full bath. Open living areas, including a family room with fireplace, an efficient kitchen with breakfast area and formal living and dining rooms, complete the main floor. Upstairs, two additional bedrooms share a full bath and a loft area open to below.